Learning to drive in and around Purley is great if you are a complete beginner or an advanced learner. There are plenty of wide, quiet roads for a complete beginner driver to build up their confidence and to practice the basic handling of the vehicle, before gradually working their way up to driving on major roads. 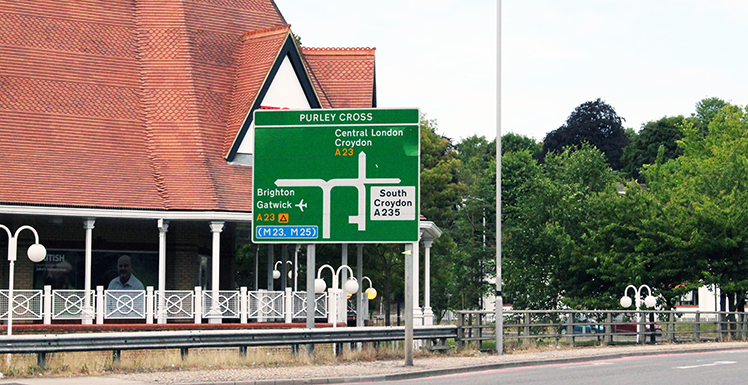 With Purleys location, the more advanced learner can practise their driving skills with the challenging Purley Cross. This one-way system can start from one lane, which leads into 3 lanes and even 5 lanes, so planning ahead is key to arrive at your correct destination. On your Driving Lessons in Purley, our driving instructors will be able to guide you around this system very easily. Our students have mentioned that, after driving around the Purley Cross on their driving lessons, they have become back seat passengers and helped their parents to better understand their own lane discipline. Our driving instructors will plan their lesson plans around their students ability, this will help to get the best out of each lesson saving you time and money. With the Brighton Road running through the heart of Purley there is plenty of practise to be had with the likes of pedestrian crossing lessons and junction lessons. Local Driver Instructor in Purley. Meeting traffic driving lessons are ideal around Purley Oak strain station. The train commuters park their cars on the local side streets, meaning there isn’t usually much room for two vehicles to pass side by side. Our driving instructors will teach you to early identify the spaces where you can move into to hold back and wait for on coming traffic. This ensures you leave yourself enough room to safely drive back into the normal driving position. Whilst taking your Driving Lessons in Purley with Signal, our driving instructors are spoilt with roads in which to teach you the skills needed for the reverse parking exercises. These will need to be demonstrated on your practical driving test. They include; parallel parking, left reversing round the corner, turn in the road and bay parking. Our schools Driving Instructor in Purley share the same tips for reference points to make your learning easier and less stressful. All our Driving Instructors in Purley are CRB checked and registered with the DSA (Driving Standards Agency).